Amy Nshanyan joined Peterson Bradford Burkwitz in 2018. Ms. Nshanyan practices in the firm’s litigation group, focusing on professional negligence and employment law in administrative proceedings. After graduating from the University of California, Irvine with a Bachelor of Arts in English, she worked in business litigation for almost three years before deciding to pursue a career in law. 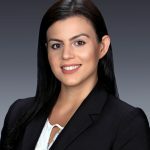 Ms. Nshanyan then attended Southwestern Law School and earned her Juris Doctor in just two years from the prestigious SCALE accelerated program. During that time, she externed for the Honorable Gregory W. Alarcon of the Los Angeles Superior Court, gaining practical experience through legal research and writing memoranda. She also clerked full time for a local law firm while in law school, and acquired extensive knowledge in property law, specifically eminent domain. Ms. Nshanyan is a member of the California State Bar and the United States District Court for the Central District of California.